Suzanne Kavanagh: Want to know what the evil of modern times looks like? Want to know what the evil of modern times looks like? 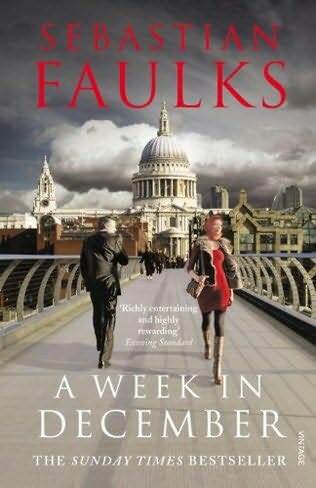 Sebastian Faulks gives you a damn good idea. But don't let me mislead you. Let me try to explain why. A Week in December recounts the story of seven people in seven days. A tube drive; a young radicalised Muslim man; a super rich hedge fund manager; a Polish footballer; a book reviewer; a rich, marijuana smoking teenager; and an underperforming lawyer. Their intertwined stories unfold over the week. How does a footballer meet a stoner teenager? Why would a financier dine alongside a literary book reviewer? What happens when your beliefs and your life are on the line? And how far do you think one banker is prepared to go in search of profit? As the strands of the story unwind, then intertwine, the sense of impending doom increases. But at the end, the biggest villain of all is not who you think. A Week in December is a telling indictment of our times and a parable of what may be. This gripping story will get under your skin.